For some, if you’re sending out quotes and hitting your targets, that may be enough, but often with our customers, we can find at least one area to improve. How long are your quotes taking to get out of the door? If quotes can be made quickly they are more likely to result in sales success. 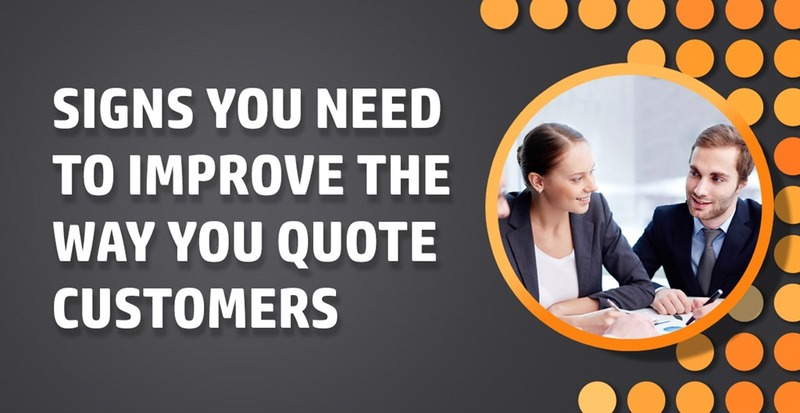 If you’re finding, due to complexity, that your quotations have multiple touch points internally (or even throughout your supply chain), it can cause delays. Or perhaps you’re so busy, your teams’ just haven’t got time to respond to leads efficiently. It might be time to assess how you can shorten the cycle and improve quote conversion rates by 30%*. Are your sales teams discounting too much? In anticipation of winning a deal it is quite common to offer large discounts and these are not always feasible or financially viable for the business. It can be difficult to manage even if staff are told not to go below a threshold. Looking at ways to manage discounting and grow attach rates will help protect profit margins. You could increase monthly quotation values by as much as 40%*! How are your quotes calculated? So many people are still using good old-fashioned spreadsheets! However good they are at using them, manual calculations always leave room for mathematical errors and out of date information. Sales Teams should be quoting with real-time information. Moving away from spreadsheets will not only speed up the quotation process but will decrease the chances of human error. Do you require product specialists or solution architects to help your sales teams quote? When specialist staff are required to support the sales team this not only increases your overheads but delays your quotation cycle. If you’re selling complex products it is impossible to expect your sales team to know the technicalities and compatibility of what might be thousands of products, but there is a more efficient way of supporting them. You could reduce workload by as much as 50%*. Is your customer service team spending too much time rectifying orders and managing returns? What if they could be using that time offering courtesy calls and managing customer satisfaction instead? If quotations are accurate and 100% validated every time, not only does it speed up the sales cycle but it can reduce the number of enquiries/complaints and reduce the impact of managing costly returns by 4.9%*! Are customers waiting too long for delivery? This might be because they are accepting quotations for products that are out of stock. If stock was transparent then an alternative solution could be found and delivery made quickly. Is your customer base growing more quickly than your sales team? Not a bad problem to have, but you will lose business if you can’t respond to all your leads. Harder still, when those leads are coming in from other countries with language and currency barriers. What if you could remove these barriers to entry and operate in any market where there is business? After this quick assessment, there is a strong chance that at least one of these areas for improvement is an on-going issue in your business. So rather than just carrying on doing things the way they have always been done, let’s try and fix it. CPQ Software can be offered as standalone or integrated within webstores either as a plug-in or a single web service call, enabling customers to self-serve and manage their own complex quotations. If you think it is time to improve the way you quote your customers then get in touch, for an informal discussion or download our whitepaper on Increasing Revenue and Reducing Workload to learn more. How can CPQ Software help your marketing teams? Return on Investment (ROI) – Time and time again Marketing teams are asked to show their return on investment and it’s not always easy to do. Seeing your quote volumes increase YoY after adopting CPQ Software with detailed reporting not only demonstrates your ROI but breaks it down to a granular level. Promotions – Ensure your promotions are not missed or forgotten with auto-add technology in your CPQ Software. Detailed reporting will show you the typical configuration types for market insight. Go-to-Market Strategy – Control exactly when, what, where and who sees your new products and promotions. Market Research – With real-time, detailed reporting find out exactly when, what and where your customers are quoting for valuable segmentation data for your next promotions and campaigns. Advertising – The most targeted adverts you’ll ever run! Get right to the heart of your market by advertising in your CPQ Software or better still, if your CPQ Software is Multi-Vendor like Freebird, why not sell advertising space and make some money?! New Product Introductions – A new and additional route to your customers. The greatest value here is for Channel Marketing teams where Multi-Channel CPQ Software such as Freebird are used. Add your new product at host level and release it to every instance of your tool and instantly you’re market-wide! Upsell – Something we are all asked to do more of! It has never been easier with auto-add features as well as recommended options. Brand – Beat your competition with faster quote-to-order cycles and lower error rate (less returns) for a reputation all marketing teams would be proud of. To learn more about CPQ Software, how it can integrate into all your internal systems and how it can help your marketing (and sales!) teams visit our website or contact us. Ever wondered what CPQ integration looks like? For those that are new to Configure, Price, Quote (CPQ) tools it can be hard to understand what an integration could look like and how it can work for your business. The following diagram shows a typical CPQ integration for one of our customers. channelcentral offer the Software as a Service (SAAS) to their customer (CPQ Host) so they can make their sales processes more efficient. For those customers that would like to gain maximum efficiencies, the service is extended to their customers (CPQ Consumer) through webstore integrations. The CPQ tool suddenly becomes very powerful as it has B2B and B2C functionality to open up your market and provide real-time reporting. Whichever CPQ Service and level of integration is required, you can be assured of on-going channelcentral support and lifecycle management as part of your SAAS contract. If you would like to learn more about how a CPQ tool could help you grow your business, contact us. #BackToTheFuture didn’t predict a world where there is software developed for Sales Teams that would Configure, Price, and Quote. A world where efficiencies are maximised, revenues doubled and workload is halved! Did your sales team make it into the future or are you still using spread sheets and taking too long to get quotes out of the door? Configure, Price, Quote Software is a Sales tool designed to help companies produce accurate, configured quotes in the most efficient way possible. A CPQ tool makes configuring complex products, common in the IT Industry, easy. The tool has built in product validation rules, pricing, promotions and stock which are available in real-time. Sales Teams can have everything they need at their fingertips to both shorten the Quote-to-Order cycle but also free up the valuable resource which is your Technical Support team. Download our Whitepaper ‘Increasing Revenue and Reducing Workload with a CPQ Tool’. CPQ Software is the core of channelcentral business. We offer bespoke developments or off-the-shelf CPQ solutions all focussed on the IT Channel and Technology Sector to help improve efficiencies in your Sales Teams . Contact channelcentral today and discuss how CPQ Software can bring you and your sales teams into the future!